Northumbria are a dark ambient act. While this is true, the label barely begins to cover the depth of their sounds. Their accomplishments over the last few years have been great. They’ve attracted the attention of their current label, Cryo Chamber, which is no small feat. They’ve been featured on some high quality compilations, with their tracks usually standing out as some of the best on the respective tracklists. With that said, 2017 is the year of Northumbria. Northumbria consists of two musicians. In effect, a guitarist, Jim Field, and a bassist, Dorian Williamson. Northumbria have taken a sort of tour through various record labels since their inception. Releasing several full length albums as well as EPs and splits through labels such as: thisquietarmy Records, Consouling Sounds, Polar Seas Recordings, and finally landing at Cryo Chamber, where they appear to be content with calling their home. What started several years ago as a project fully dedicated to the use of guitar and bass drones, has blossomed this year into something wholly new and exciting. As recently as 2014, albums like Bring Down The Sky highlighted the more conventional skills of Northumbria, with marvelous slowly evolving guitar work that could almost be considered solos. These meandering guitars were planted firmly upon a guttural and earth-shaking bass drone. Helluland, their first release on Cryo Chamber, brought them to a new chapter in their lives. Helluland still was dedicated to consistently drone-laden guitar and bass work but it had taken on a more subtle feel. 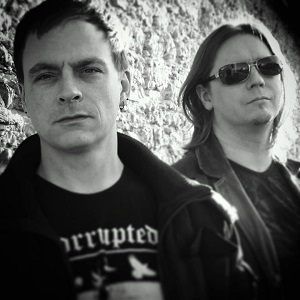 Along with the evolution of their sound, Helluland ushered in the first chapter of their current trilogy. A set of albums which is dedicated to the story of the ancient Norsemen discovering the Americas, incidentally, well before Christopher Columbus. 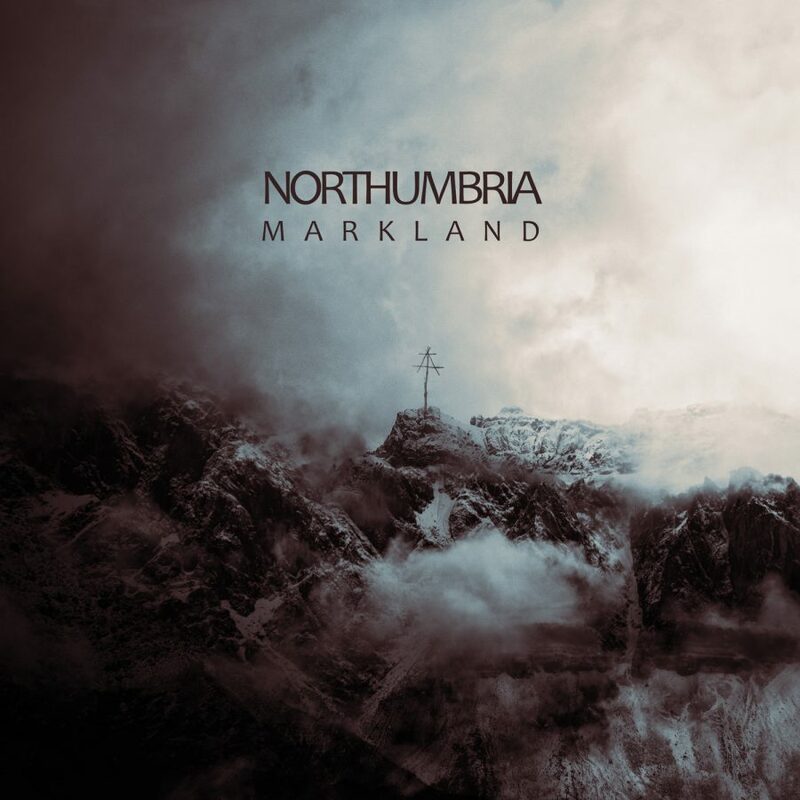 Shifting to the present day, Markland delivers something totally novel to Northumbria. This album has stepped up their production quality in every conceivable way. Markland still holds the foundations of their trademark sound, but it greatly expands beyond these foundations. Tracks like “Sunstone” look reverently back to the roots of their project. “Sunstone” has a subtle bass foundation with the same sort of guitar-work that made much older tracks like “The Ocean Calls Us Home”, from Bring Down The Sky, so successful. Even, at times, this track has shown some similarities to the magnum opus by Northaunt, Horizons. Yet tracks like “Sunstone” only show half the picture. The very next track, “The Night Wolves/Black Moon” begins with the howling of wolves. My heart jumped hearing this intro, There have been so many attempts in dark ambient and dungeon synth albums to incorporate howling wolves, and each attempt seems to fall flat. The wolves, instead of evoking the mysteries of the night in a wild land, show the lack of care taken in capturing their sounds and incorporating them into an album. Most attempts have been downright laughable. Yet, Northumbria have managed to use these field recordings in a superbly appropriate fashion. They give that sense of sitting around a campfire, deep in the woodland wilderness of Markland, presently Northeastern Canada. As the eleven minute track progresses we are delighted in the sounds of the guitar drones, washing over the subtle foundations set by the bass. Yet, just as we become comfortable in this setting, a storm arises, thunder rumbles through the skies. Meanwhile, the guitar work is becoming more ominous, taking our minds into a much darker place. By the end of the track, the bass has taken the prominent position, and with it the sense of danger and dread rise menacingly to the surface. Markland clearly has a tale to tell. This is blatantly obvious without ever reading into the back-story. Just putting on headphones and pressing play, we catapult into a dark and wild world. From the very beginning of “Torngat” we can hear the waves beating against the ship as it nears land. By the time we reach “The Night Wolves/Black Moon” the turn of events is perfectly delivered. 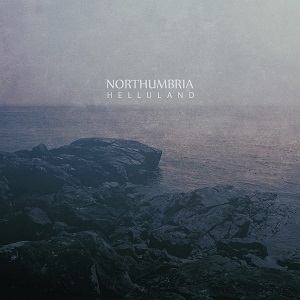 This description of the album barely scratches the surface, tracks like “Still Clearing” and “The Shores of the Suffering Wind” boast what is easily the best work by Northumbria to date. In short the album is a masterpiece. Clearly there was care and caution taken by these two veteran musicians in every step of the production. Add to that the brilliant mastering skills of Simon Heath and some perfectly emotive album art (which I would consider one of the best covers to date on Cryo Chamber). The recipe makes for a classic. An album which will almost certainly become the high-point in the career of these two musicians. They definitely stepped outside their comfort zone on Markland, delving into techniques and atmospheres that they had not previously traversed. The final result is next to perfection. I would recommend Markland to any dark ambient fan. I would consider this a perfect entry point for black metal, dungeon synth, and post-rock fans as well. Every moment of Markland is steeped in a glorious sense of accomplishment. These two gentlemen should surely be proud of their work. We can only hope that they will equal this brilliance in the future.